This holiday season discover the perfect gift for everyone on your list! 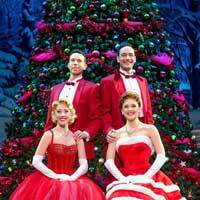 The timeless movie White Christmas is adapted for the stage in a lavish new production that the New York Times says to "put on your wish list." Irving Berlin's White Christmas tells the story of a song-and-dance team putting on a show in a magical Vermont inn and falling for a stunning sister act in the process. Full of dancing, laughter and some of the greatest songs ever written! Give everyone the gift they're dreaming of with this merry and bright holiday musical.